The fat Sears catalog was called “The Wish Book” when I was growing up. It had more than 1,000 pages of the necessities and luxuries of life: everything from bunk beds to bicycles, and from waffle irons to well pumps. But to my younger sister and me, it was so much more. It was our connection with things American—with ready-made clothes, American styles and trends, and a life that was passing us by half a world away. After I graduated from elementary school in the 1950s, my Foreign Service family was sent to its first post overseas—Madras, a small seaport town on the southeast coast of India. It was a time of propeller planes and ship travel. Communication with “the States” was by letter or telegram. In Madras most of our clothes were made by a tailor, because there weren’t any dress shops that sold European-style clothes. Even our shoes were handmade; although after the shoemaker completed a pair of loafers for my sister, Diane, that looked exactly like the picture but made her look like she had clown feet, we gave up on that. My mother would prop the big catalog on the coffee table, opening to the page that told how to determine clothing sizes. Then she would measure our arms, necks, backs and legs carefully with a tape measure. Finally, she would get out pieces of white paper and a pencil and carefully trace around our stocking feet to send with the shoe order. How it tickled! After having us try on friends’ clothes of various sizes, recording our latest measurements and relying on her intuition, she would guess how big we would be when the clothes arrived by ship three months later—not an easy task with rapidly growing teens. Meanwhile, my sister and I would pore over the catalog, picking out first what we needed and then what we would like to have, staying within the boundaries our mother had set. Shipping was expensive, so we had to be careful. My sister and I would pore over the catalog, picking out first what we needed and then what we would like to have. At last the ship would arrive, and the package would be delivered to my father’s office. We were always excited when he brought it home, but he and my mother would whisk it into their bedroom and firmly close the door. We had to wait impatiently as they removed secret birthday presents and Christmas gifts. Finally they would allow us into the room. On the bed was the wonderful box, packing paper scattered and clothes folded very flat, smashed from their many months’ journey. We never knew what we were going to get until the box arrived. Sometimes items were out of stock. Sometimes the store substituted something “similar,” although we did not consider the box of clove Life Savers a fair substitution for the fruit-flavored ones Mother had ordered as a treat. When the style of shoes I had chosen arrived in my sister’s size and hers in mine, I learned that they could also make mistakes. But things didn’t always go wrong; sometimes when things arrived, they were perfect. In one of those perfect orders, we each got an entire outfit—pedal pushers, knit turtlenecks and pendant necklaces. Another time I got some low-cut saddle shoes with tiny black buckles on the back of the heels. Some of my friends said that you unbuckled them if you were “available” and buckled them if you were going steady. I wasn’t sure about that, so I just kept them buckled. I wore those shoes until they fell apart. After a few years overseas, we came back home to department stores, the first shopping malls and all things American. But while we were in India, the Sears-Roebuck catalog was not just a way to acquire necessities, it was our window to our homeland. Michele Ivy Davis is the daughter of the late FSO Michel M. Ivy, economic officer at the consulates in Madras (now Chennai) and Bombay (now Mumbai) during the 1950s. She was 12 when her family left the United States and 17 when she returned. A grateful recipient of an AFSA scholarship, she studied at the University of Maryland. 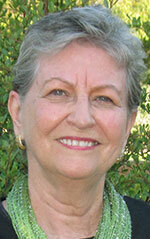 After owning several businesses, she and her husband retired to California, where she is now a freelance writer.